Our Lever Lock Arm securely locks in the desired keyboard platform height. Features a low profile, progressive ball bearing slide track for smooth, maintenance free operation. 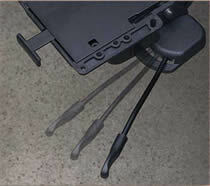 Height range of 0 to -6"
ADA (Americans with Disabilities Act) lever allows simple adjustment and locking of height position. Pull tab operates with just 3 lbs. of finger-tip effort. Our ThinGlide progressive ball bearing track provides maximum knee clearance and smooth, consistent operation. 360° swivel allows for easy positioning and storage. Step 2 : Track Length ...27 13/16" track length for desks deeper than 8"
2179 -SP Swivel Plate 3 Lbs. 177-1 Mounting Spacer (1" Thickness) 10 Lbs. 177-3/4 Mounting Spacer (3/4" Thickness) 8 Lbs. 177-1/2 Mounting Spacer (1/2" Thickness) 7 Lbs. 177-1/4 Mounting Spacer (1/4" Thickness) 5 Lbs.